The famous Western showman got a deluxe treatment from Mego, complete with rifle, six gun and a great outfit. Variations on outfits aren’t just for Soldier Apes anymore, here are the two types of Buffalo Bills, both pulled from solid boxes. Buffalo Bill also came on a Kresge card and later a Lionrock card. 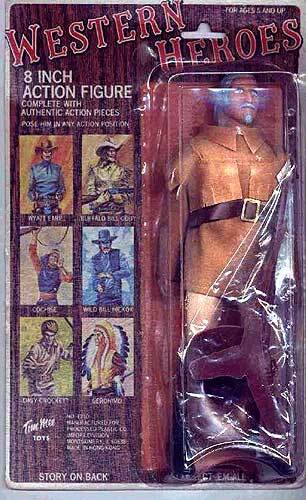 LionRock carded Buffalo Bill is rarely seen, according to Ron (the owner who donated this fine pic) he has a Robin Hood Dagger instead of his regular Mego knife.. The original Gray Morrow artwork is signifigantly larger than the packaging itself. Morrow also did the art for the Mad Monster Series. Photo courtesy of Ron. 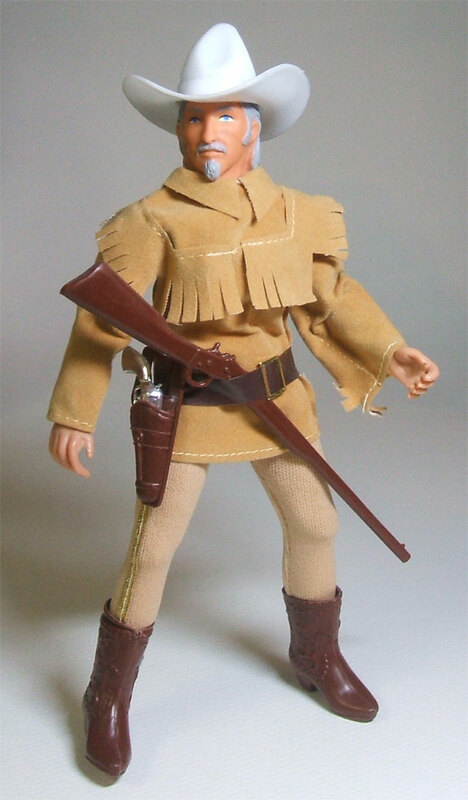 Although similar in design to Davey Crockett’s shirt, Buffalo Bill’s deerskin shirt is different and unique to the character. It should be noted that there are variations in color on the original Buffalo Bill shirt. The color pictured is pretty common but there is a lighter tan variation. This shirt has been reproduced by Classic TV Toys, although the reproduction is a little darker than the original Mego variations and made of a softer, more flexible material. 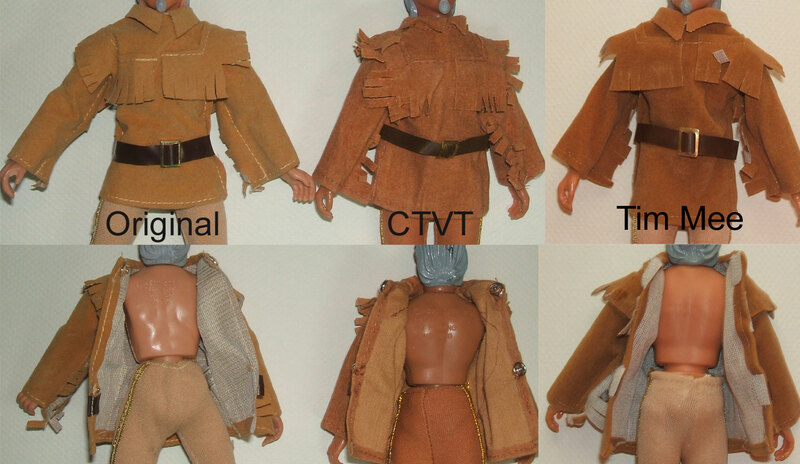 The fringe on the sleeves and chest are cut longer on the CTVT version, and the belt and belt buckle are smaller. It is also a touch longer than the original and it is unmarked. The vintage reproduction by Tim Mee Toys is very similar to the original in material, although a slightly darker tan in color. The belt buckle on the Tim Mee shirt is a little thicker and more rounded on the edges and is positioned higher up on the shirt than the original Mego version. The TM shirt is overall longer than the original. Buffalo Bill wears tan strechy pants with gold trim on the outside of the legs. Usually, these pants have close “sock feet” and the trim only goes down far enough to fit into the boot. Recently, Bill was found with a variant pair of pants. This variant has open feet but is long enough to fit over the toes and heal. The trim on this variant goes all the way to the bottom of the pant legs. The common closed toe version of Bill’s pants have been reproduced by CTVT. The reproductions are a much darker tan and a much thicker material. The Mego pants are made of the same material common to most of the WGSH jumpsuits, while the CTVT uses a thick stretch cotton material for their version. The gold trim on the CTVT is also wider and thicker. 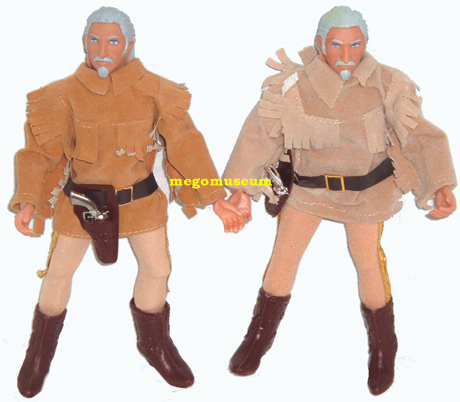 Tim Mee Toys also reproduced these pants during the Mego era. These vintage reproductions are very similar in color, although the material isn’t as soft. The TM pants fit more snug and are sewn differently. The original Mego pants have a seam in the front and back of the pelvis area, the Tim Mee only has a seem in the back of the pelvis area. The Trim on the Tim Mee is the same as the original, but Tim Mee used gold thread to secure it, making the thread almost invisible on the trim, while Mego used white thread which is more noticable. Bill wears a hat that is unique to him. This hat has been reproduced by CTVT. The repro hat has a touch shorter and wider crown. The finish is a little more glossy and the brim has a rough look around the edges, not quite so rounded. The CTVT hat is stampted CTV under the brim. The vintage Tim Mee Buffalo Bill hat is easy to spot. The exact same hat as the original mego, only in dark brown. 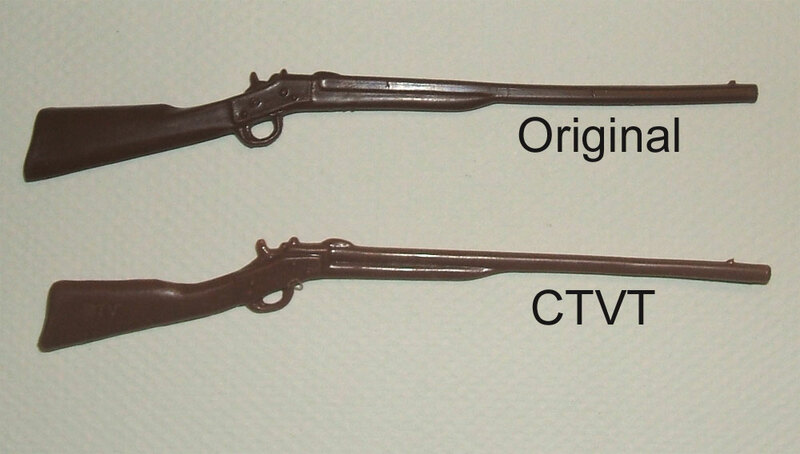 The rifle Bill carries is common to many figures in the Western line and has been factory reproduced by CTVT. The original is brown with reddish tints where the repro is a pretty pure brown and is lighter in overall color. The repro is marked CTV on the stock. 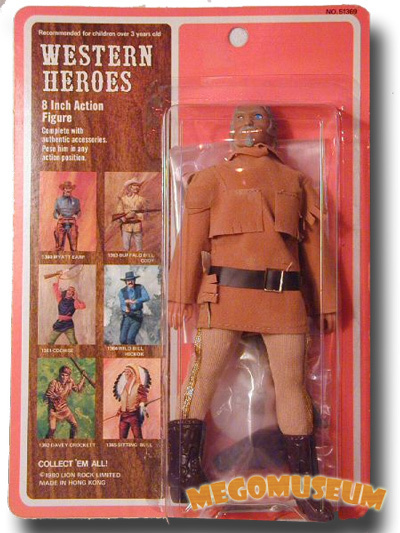 Also made during the Mego era by Tim Mee Toys for their version of the Western figures, the vintage Tim Mee reproduction is exact in almost every way. So exact that a photo doesn’t show the slight difference, which is why it is not pictured. The Tim Mee is just a slightly lighter shade of brown and just a touch more on the reddish side, although not near as much as the CTVT reproduction. Bill’s holster is unique in that it’s not attached to the belt permanently. In most cases, it clips on to the vinyl belt sewn into the shirt. This is the most common version. Recently another version was pointed out that doesn’t clip onto the belt, but instead has the belt threaded through slits in the holster where the clip is on the other version. 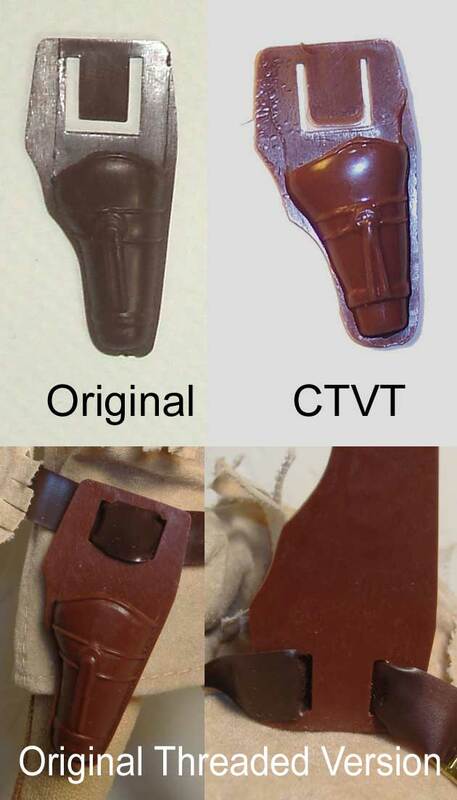 The clip version of the holster has been reproduced by CTVT. The reproduction is a lighter brown in color, has a wider clip portion, and isn’t as clean around the edges as the original. The repro is stamped CTV on the back. Tim Mee did not reproduce this holster. For their version of Bill, they used the mold for the Action Jackson belt/holster combo. Buffalo Bill has the same pistol as others in the Western and Willer lines. The pistol has been reproduced by CTVT. The detail on the reproduction isn’t quite as sharp as on the original and flashing is evident. Some are marked CTV on the gun grip and some are unmarked. Tim Mee reproduced the pistol. This is a vintage piece, reproduced during the Mego era. Same mold, just in gray instead of chrome. Otherwise it’s identical. The western boot worn by Buffalo Bill can be found in the AJ Western set as well as on most characters from the Tex Willer Line. They have been reproduced by CTVT although it get’s a little weird. 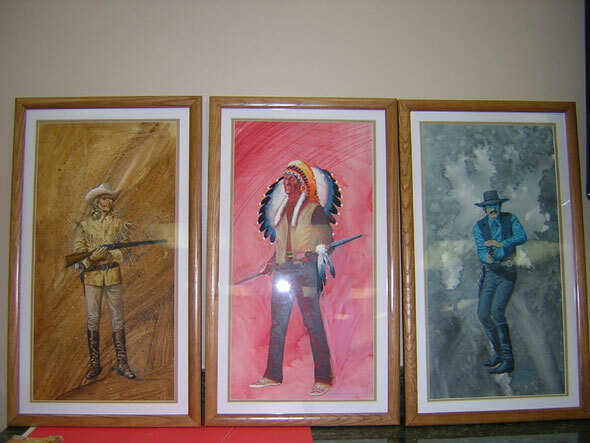 The Tex Willer characters and Buffalo Bill wear the same carmel colored boots. For some reason when CTVT reproduced these, they created different colors. The reproductions found on the Willer guys are a much darker brown than the original’s. A much closer color can be found on the Buffalo Bill reproduction. Both colors are a little more narrow and a little taller. There is flashing evident on the reproductions and they are unmarked. Tim Mee reproduced this boot for their vintage reproduction of Buffalo Bill, and they are dead on in most respects although TM chose to outfit Bill with black boots instead of brown. The black Tim Mee boots say made in Hong Kong on the side of one boot. Buffalo Bill from the Western line, King Arthur from the Knights line and Kit Carson from the Willer line all share the same head sculpt with a different paint job. Any of these original heads could be repainted as any other, although Kit being the more rare figure it is more likely that one of the other heads would be repainted as Kit than the other way around. All three versions of this head have been reproduced by CTVT. The repro heads are softer in material and all have higher eyebrows and bigger eyes painted on them. The repro’s in all forms are unmarked. 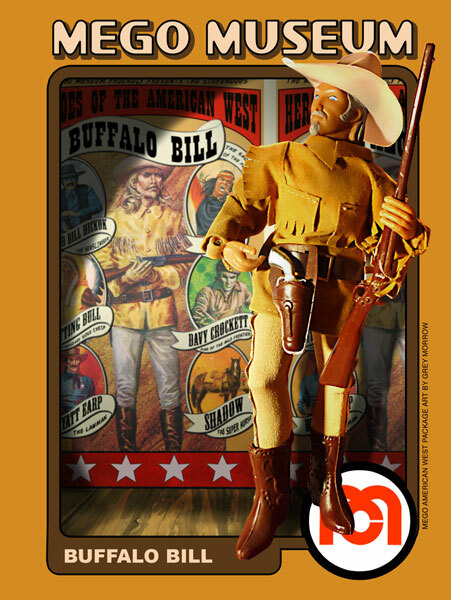 Tim Mee also reproduced the Buffalo Bill head during the Mego era. It is a vintage piece and made from the same molds. The material is a little softer, but otherwise it’s pretty identical. The only other difference is Tim Mee put white dots in the eyes.